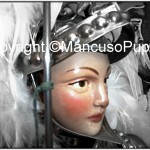 It 's very difficult to pinpoint what time of the puppets are born (Latin Pupus, which means little boy) and the place from which this tradition; the first and few examples have been written by Giuseppe Pitre (founder of demologia, the science that studies the events, traditions, the culture of the people). 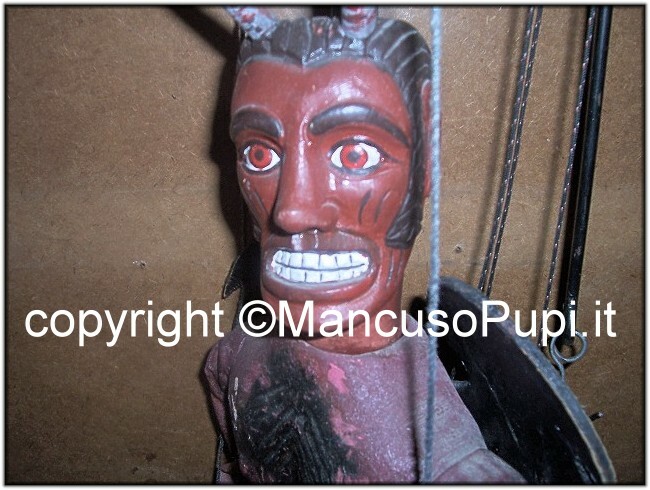 Some scholars of 1700 assumed that the skill of the puppeteers came from Syracuse to some very good in building and moving puppets in the time of Socrates and Xenophon. 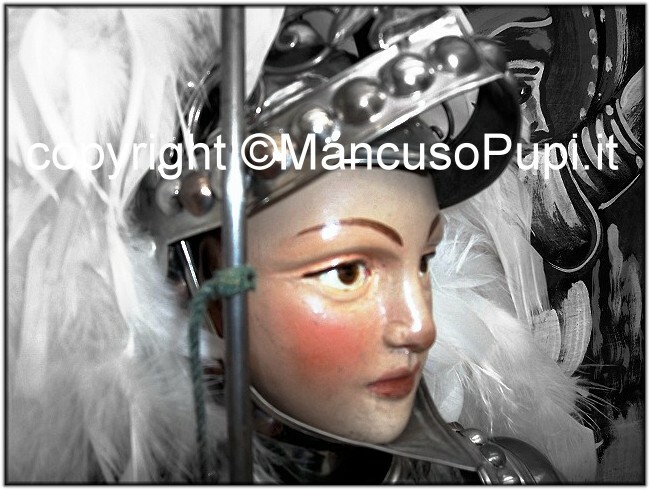 In 1700 with puppets in the puppet page (Unarmed) represented some Sicilian stories; All these works have come to us only the farces, that are still represented. 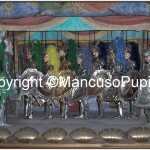 They remind us of the "Vastasate", performances brought on stage to "Plan of the Navy" in a booth called "casottu vastasi of them" led among others by comedian Don Peppe Marotta. In the same period in Palermo there were many "Cuntisti", affabulavano that intrigued the audience with stories of spells, betrayals, deception, love, duels and battles. 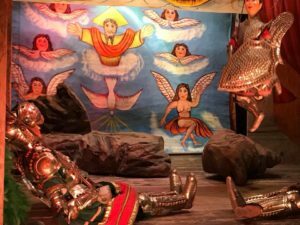 The people followed the entire story to tell stories and followed a character from birth to death. 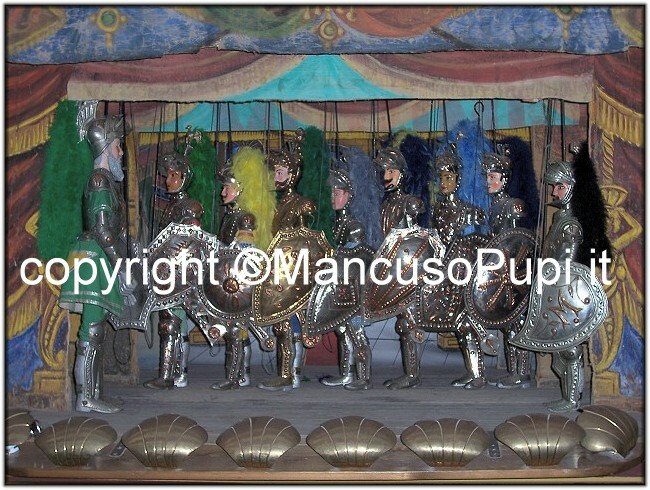 Taking a cue from these narratives, two puppeteers, Don Gaetano Greek and Don Liberto Canino decided to dress their puppets in the page with the reinforcement, building warriors Christians and Saracens, on the basis of existing frescoes in the Palazzo Reale and the Steri. Copied the style of weapons, creating models and began to build the pieces of armor, first in a rudimentary way, increasingly sophisticated and technically better articulated. The faces, perfectly carved, redeeming some misdemeanor of the structure and gave the baby to the immediate nature of the character, or that he was proud of burlesque. 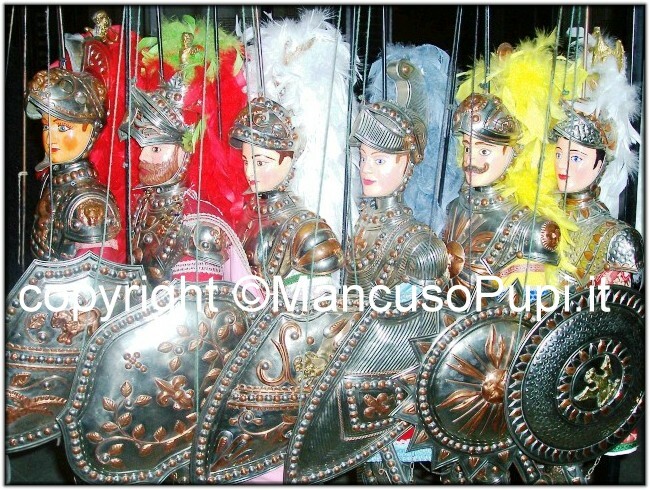 In the Work of Puppets one has the highest transmission of codes of conduct by the ancient origins that have affected the Sicilian people, codes like the cavalry , the sense of honor, the struggle for justice and faith. Among the main themes from the opera of the puppets should be noted that this is the prevailing discussion of subjects of chivalry. The main sources for this theme are the Chansons de Geste that result in the Carolingian cycle covering a historical period from the death of Pepin the Short to the Emperor Charlemagne. The Cycle of Charlemagne provides a particular subdivision: "The story of Hector and his descendants", "The Kings of France from Constantine to Charlemagne", "History of the Paladins of France", "Guido Santo and the descendants of Charlemagne". 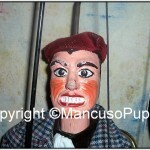 The Puppet Opera is the traditional puppet theater in southern Italy. There are three different traditions: the "Palermo" widespread in Western Sicily, the "Catania", widespread in eastern Sicily and Calabria, the "Neapolitan", widespread in Campania and Puglia, which differ in some aspect of the mechanical, figuration and for some subject. The craftsmanship of a baby has remained the same as that applied by the first builders. 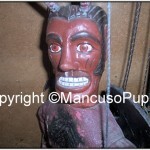 For the construction of the bodies, and heads of animals is used beechwood, Walnut, lime and cypress. The skeleton is prepared in nine pieces which are then divided: two feet, due gambe, two legs, a bust, fist or hand and double hands. These parts are fitted together with the wire. The frame is measured from the left foot to the shoulder, The right foot is shortened by a few millimeters, expedient useful to facilitate the first step. The measures range from dell'ossatura 45 cm for boys and for angels, to 62-63 cm for men and mixed pages; we arrive at 65 cm for the riders and the 70 cm for the Giants. The arm is structured with a strong canvas leaving freedom of movement; the canvas is attached to the shoulder with nails and wrists with a cord plugged. At the center of the bust, at neck, a wire is threaded through two holes that take the form of "U" and is attached to another piece of wire attached to a hollow body, precisely in the part of the neck. The latter serves to give the iron head of the ability to engage and support the weight of the baby. 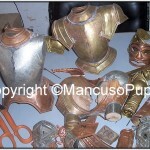 The metal plates are used for nickel silver or brass with copper arabesques. 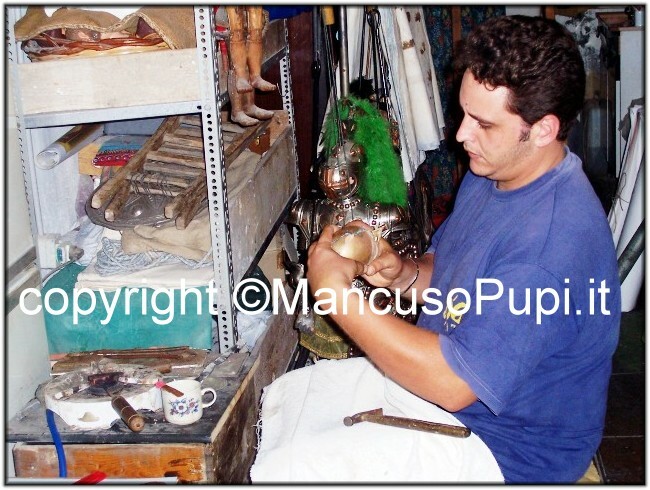 The only character that from all puppeteers is made half in copper and brass or nickel silver for half is Brandimarte. Each manufacturer has created its models, which then gradually perfected; on a slab of metal mm 5 we mark all the pieces and cut out. 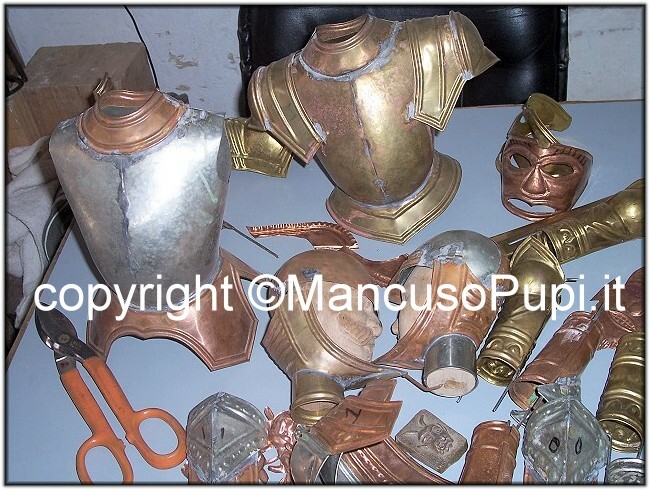 The processing is done in the following way: each piece is flattened and then shaped by hammers ball; the shield, the knee, bracelets, the helmet and shoulder caps are machined on logs of wood have shaped; All the pieces are folded around the edge with the "pen hammer" needed for ornaments. Finally we pass to the seam between the pieces on which you apply the arabesques. On each frame are fixed signs, that traditionally identify the characters. The latest work and polishing and then mounting. 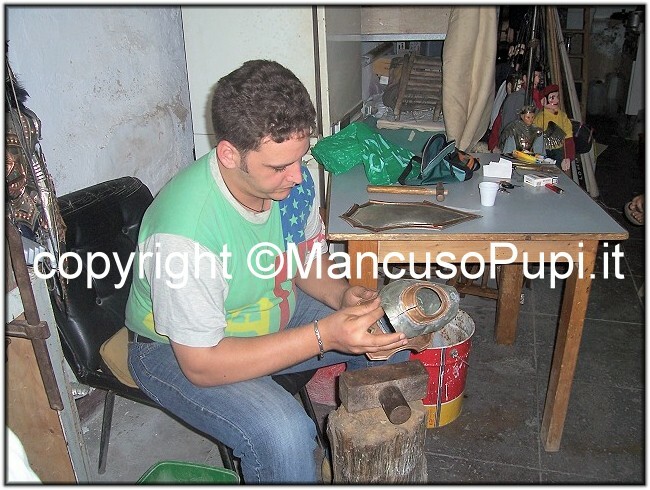 We prepare two iron rods 7,5 mm in diameter and the length of 75 cm; the first rod bears the weight of the baby and at its end, at a distance of 10 cm, is inserted into a wooden handle, which gives the possibility to puppeteer can control all the movements of the body. The end of the rod is then bent into a crescent-shaped because the baby can be hung in the scene that is outside; the other wand is to engage in the right wrist and gives the movement during the action. A string, tied to his left hand through a hole between the index and middle fingers, serves to move the hand in conversations and to raise his shield to ward off the blows during battle. A second cord, tied to the handle of the sword, passes through the hole in his right fist and going to be tied into the iron that gives movement to the wrist; a third, fixed to the left thigh, gives the baby a chance to kneel, or ride on horseback, to show the tremor of the foot with impatience or anger; last string is tied to the iron support and the visor so you can lower or raise. All cords are dyed with aniline black. 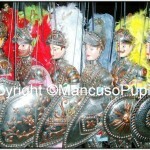 Prepare the suit for the pages : for paladins using a "faroncina", while the Saracens a few breeches with bright colors. The swords or scimitars are prepared in sheet steel, while the handle and the emblem that goes to the crest is derived from the melting of scrap metal. An armed baby weighs seven to ten pounds. The baby is too high from Catania 110 cm a 140 cm, weighs about 30 Kg and has stiff legs, why can not kneel. It can extract and put the sword into the sheath: the sword is permanently fixed to the right hand, even when a woman embraces. The visor of the helmet can not be closed. The electrodes consist of metal; signs are embossed directly nell'armatura. The maneuver takes the baby from, Who moves the baby, then is placed on a raised(bridge) backstage; The manipulators are supported from above with the arms of a barrone, that the puppeteers call "scannappoggio". 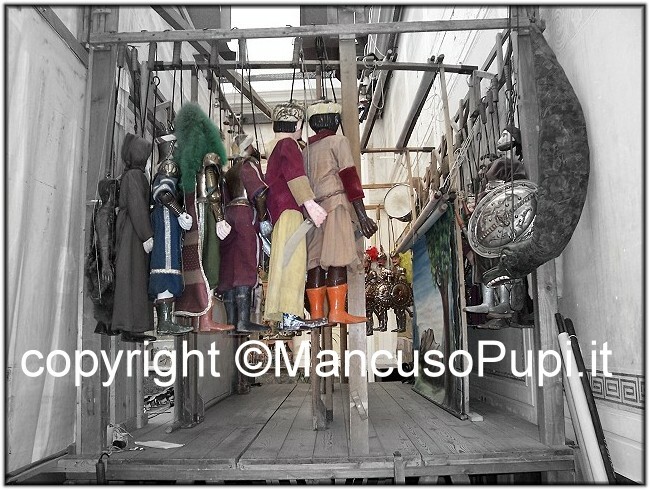 Aides who are inside, disengage from their seats they hold out the puppets and the manianti, that the characters had to make the first move and make them come back on stage . The baby can longitudinally across the entire stage area, given that the shunter parallel walking behind it and behind the backdrop; can not move to the proscenium most of the length of its arms. 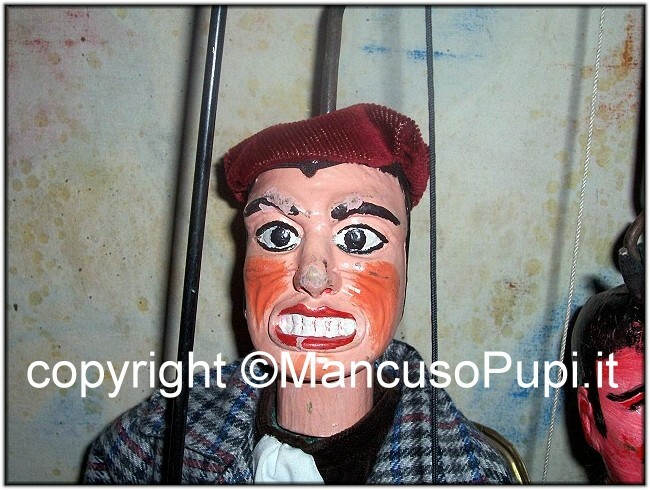 Reciting the puppeteer who gives voice to all the puppets , stands between the prospect and the fifth in order to be able to directly follow the movements and then give them character. The voice of the female characters are given by a narrator. 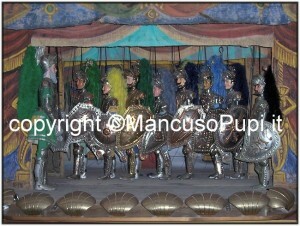 Each manipulator can move only a baby at a time, for this deck there are at least four fighters and two shunters manianti in the wings. The proscenium is where the action is off 4 m deep and about 2,50 m; a perspective of 8 m covers the entire front structure of the proscenium, including lateral. A 2 m depth there are two wings which are lowered between the seabed; behind the scenes there is placed a high bridge 1 m from the stage.